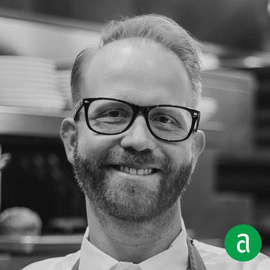 Jonathan Searle, Executive Chef at Lockbox in Lexington, KY, shares his career timeline and words of advice for up-and-coming professionals. I am so grateful that I get to make a living doing something that I love. In my kitchen, we strive to create an environment that will not only teach our team to improve their cooking techniques but also teach them how to be better humans. We treat each other with respect as we pursue a like-minded goal. My hope is that we influence their lives in a way that goes beyond teaching how to be a great cook. I felt a connection with the kitchen pretty much from day one. I fell for the stress, high stakes, attention to detail and the crystal clear fact that my validation was in the work. I was free to put as much of myself into the work as I wanted. What sparked my interest in leadership was when I started to understand how rewarding it was to take what I was learning and contribute it back to the team. I knew this was truly the career for me when my love of cooking, taking care of the guests and teaching all came together. The most important skills to possess as you’re coming up are the ability to truly listen, not just hear, and selfless teamwork. Self-awareness is not something that can be easily taught. The same goes for work ethic and humility. I would rather find a candidate with these qualities and teach them cooking skills than have a fundamentally strong cook with a bad attitude and a lot of pride. The skills I look for in an aspiring candidate are pretty simple: my ideal candidate has an above average amount of self-awareness, is hardworking, humble and intelligent. In a small city like Lexington, KY, the talent pool is small, so you really have to start from scratch. I don’t spend as much time looking at a resume detailing where someone has cooked as I do getting them in the kitchen for a stage and getting to know their personality. The produce, the people and the region itself – along with all the agricultural possibilities in the Ohio River Valley and on East into the Appalachian region– are all great sources of inspiration for my team and I. Connecting my cooks back to the food and where it comes from, far before it is placed in their hands to mise for service: that’s what it’s all about.